You brush and floss every day to rid your teeth and gums of disease-causing plaque. But while “showing up” is most of the battle, the effectiveness of your technique will win the war. So, how good are you at removing plaque? One quick way to find out is the “tongue test”—simply rub your tongue along your teeth: they should feel smooth and “squeaky” clean. Surfaces that feel rough and gritty probably still contain plaque. For a more thorough evaluation, your dental hygienist may use a product during your regular dental visit called a plaque disclosing agent. It’s a solution applied to your teeth that dyes any bacterial plaque present on tooth surfaces a certain color while leaving clean surfaces un-dyed. The disclosing agent shows you where you’re effectively removing plaque and where you’re not. These products aren’t exclusive to the dental office—you can use something similar at home if you’d like to know how well you’re doing with your hygiene before your next visit. You can find them over-the-counter as tablets, swabs or solutions. You may even find some that have two dye colors, one that reveals older plaque deposits and the other newer plaque. You simply follow the product’s directions by first brushing and flossing as usual, then chewing the tablet, daubing the swab on all tooth and gum surfaces, or swishing the solution in your mouth like mouthwash for about 30 seconds before spitting it out. You can then use a mirror to observe any dye staining. Pay attention to patterns: for example, dyed plaque scalloping along the gum line means you’ll need to work your brush a little more in those areas. 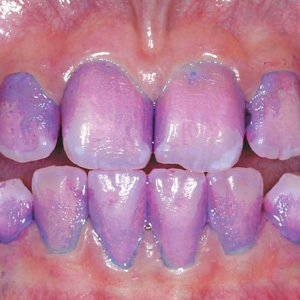 The dye could color your gums, lips and tongue as well as your teeth, but it only lasts a few hours. And while plaque disclosing agents are FDA-approved for oral use, you should still check the ingredients for any to which you may be allergic. All in all, a plaque disclosing agent is a good way to occasionally check the effectiveness of your plaque removal efforts. By improving your technique you may further lower your risk of dental disease.